So, yesterday, while nervously awaiting election returns I decided to make myself useful and repaint our front door. I removed the door knocker, kick plate and hardware and I was off to the races! Ready for the front door reveal? The front door looked pretty bad. After all, it’s 13 years old. It has several dings and scratches. I sanded it as best I could and wiped it down. Once dry I used a foam roller and rolled the entire door without a brush. There are still lots of imperfections, but still it looks much better, right? 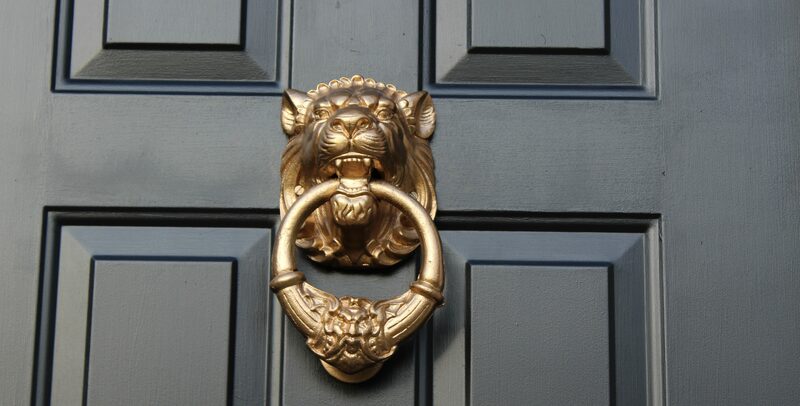 I spray painted the lion head door knocker with Valspar Metallic Billiant-Metal Effects in gold. He looks as good as new! Plus, it’s a nice change. It was a huge challenge getting it back up because I had to feed the two long screws through two layers of the metal door. Whew! My original plan was to spray paint the handle and kick plate but once I removed them I decided them to clean them instead. I used a combination of lemon juice, Tarn-X and believe it or not, a Brill-O pad. And LOTS of elbow grease! They looked much better cleaned and polished so I’m glad I didn’t paint them. I hope you have a wonderful day! You can follow me on Instagram and Facebook too!